← あげましておめでとうございます・Merry Christmas and Happy New Year! Following the exhibition held last fall, the Kachi villa designed by Arata Endo in 1928 will be opened to the public this spring. 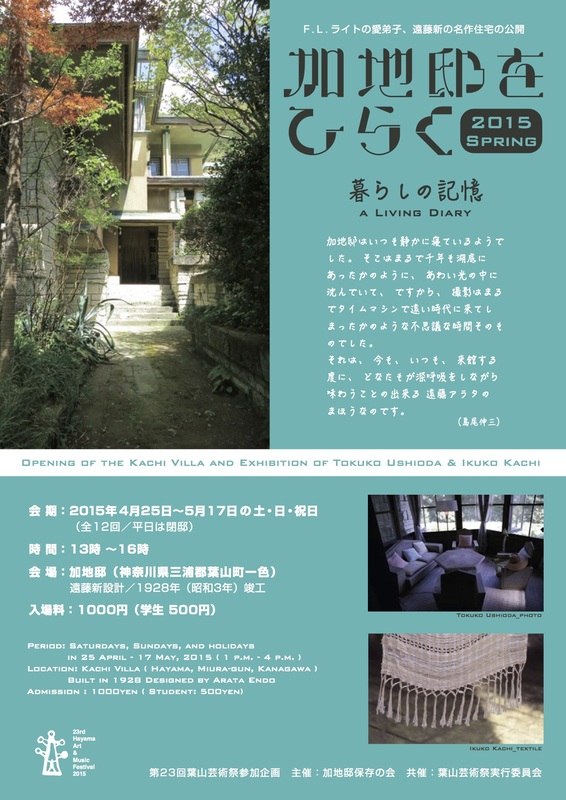 This event will be held as part of the Hayama Art & Music Festival 2015 and it includes photography and art works by Tokuko Ushioda & Ikuko Kachi. No booking needed, open during weekends and holidays only. For detail information go to the Heritage Houses Trust news page here. This entry was posted in Events, Heritage House Trust Events. Bookmark the permalink.